At the Big Green Gathering 2003 (held in the heart of the Mendip Hills, near Cheddar, Somerset, England) on Saturday the 2nd of August 2003, the World's First Solar-Powered Internet Rickshaw was launched across a muddy field amidst an atmosphere of hilarity, surprise and downright disbelief. Following their their debut event in 2002 at the Big Green Gathering, Wireless.psand.net returned a year later intent on entertaining and educating surprised festival goers and crew alike. Supplying site-wide wireless access using a satellite dish for Internet connectivity had become second nature to the Wireless.psand.net crew. On the look out for a further challenge, they were determined to demonstrate just how "mobile" mobile can get. To put the event into perspective, the Big Green Gathering is a annual get together of people attempting to provide inspiration and education on alternative approaches to daily living that could lead to a cleaner and healthier future for local and global communities. Conventional distributed mains and fossil fuel generated power are disallowed, leading to a demonstration of inventive technologies that are hopefully less harmful to the planet. An OS (Ordnance Survey) map of the site is available here. The arrow indicates the location of our satellite communications vehicle. Here is a larger map to put the OS map into perspective. Connection to the Internet was made using a bi-directional satellite dish provided by Norsat and an EMS satellite terminal connected to the Astra platform. For more details of this unit and its operation, please refer to this previous article. This gave us a connection of up to 2Mb/s down the way and 384Kb/s up the way; although tests we have made show this to be commonly (or more reliably) in the region of 1.5Mb/s down and 250Kb/s up. Our two-way SIT (Satellite Internet Terminal) was connected to a Dell Inspiron 7000 laptop running the Debian GNU/Linux operating system, which was acting as a DHCP (Dynamic Host Control Protocol) server, dishing out IP (Internet Protocol) addresses to clients, and also providing DNS and Web proxy services. The proxy servers help greatly improve the responsiveness of the web experience of users connected to a SIT as it compensates in part for the large latency times (see appendix) (an average of 650ms ping times) of the connexion; which is a type of network known as an LFN (Long Fat Network). Refer to RFC 1323 for more information on LFNs. To this network, we connected standard wireless base-stations. The models we used were Buffalo Technologies WBR-G54, which although capable of 54Mb/s, complying to the 802.11g standard, were actually configured to use the older 802.11b 11Mb/s standard as we needed to ensure that the majority of wireless clients could connect to our network. This model also comes with a 4 port switching hub. We were providing about 20 acres (8 hectares) of the site with wireless connectivity and needed three wireless base-stations connected to cover most of this area. The base-stations were configured to use channels 1, 6 and 11 (three non-overlapping frequencies - 2.412, 2.437, and 2.462GHz respectively). The one employed to link to the rickshaw was set to channel 1. As we already had a DHCP server (in the form of the Dell laptop), this base-station was not used as a router with DHCP support, but as a bridge instead. This was achieved by connecting the laptop, via a switch (Netgear FS116), to one of the LAN ports rather than the WAN port. A pigtail was connected to the base-station's external antenna port and then, using N-type connectors, to a URM67 (microwave coaxial) cable running 4 metres (12 feet) up a mast to a home-made quarter wave omni-directional antenna mounted on the top of our communications vehicle. This dramatically improved the network coverage available outside the vehicle. 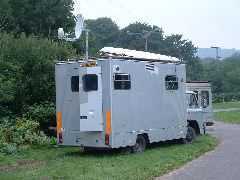 The vehicle we used with dish mounted. and the Buffalo-in-a-Box sector antenna. One of the other wireless base-stations, mounted on a pole on the communications vehicle, was one of our Buffalo-in-a-Box all-weather wireless nodes. This was not used for the iTrike, but was used to connect Indymedia and the Campaigns area of the festival to our Internet connexion. The rickshaw (or jinrikisha) is a type of two or three wheeled carriage common on the Asian continent and often used as a form of taxi in the over-crowded and over-polluted streets of its cities. It is especially common in Calcutta, India, where unofficial estimates state that there are some 50,000 of the machines currently in operation. It is said that it was originally invented in Japan and the name comes from the Japanese jin riki sha, literally translated as man propelled vehicle, however there are accounts of a similar vehicle (called a vinaigrette) operating on the streets of Paris in the 17th and 18th centuries, prior to the revolution. Whatever the case, it is certain that the idea comes from many centuries earlier. Check out this article for more information on rickshaws. The rickshaw we used for a base was manufactured in Bath, Somerset, England by Cycles Maximus and is called One Less Car - in their own words "One Less Car is a high specification three wheeler developed by Cycles Maximus to take the place of cars and vans in many city centre rôles." In this case it was far from a city centre, but coped admirably, even with its mechanics full of mud and grass. We first removed the hood and seat part (they are detachable as part of the rickshaw's design) as these were impractical for our use. This left us with a flat platform on the back of a sturdy three-wheeled machine. Next we added an armchair which we happened to have lying around (left over from the Lost Vagueness area of Glastonbury festival), then a pair of ElectroVoice stage monitor speakers facing outwards with pasting table on top of these. This formed a table suitable for putting a laptop on. 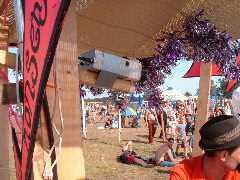 We then constructed a wooden frame that held the speakers, armchair and table in place and also provided us with support for a canopy to protect the 'internaut' and laptop screen from the Sun's rays. 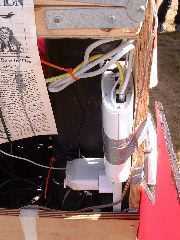 A base-station was then mounted onto the rickshaw and also configured to use channel 1 and the 802.11b standard. The two base-stations were configured in WDS (Wireless Distribution System) mode, which allowed them to talk directly to each other and therefore form a wireless-wireless bridge between the SIT and the rickshaw. 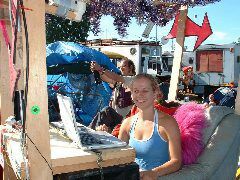 One of the LAN ports on the base-station (mounted on the rickshaw) was connected to an Apple PowerBook running Yellow Dog's version of GNU/Linux. The base-station on the iTrike was also pigtailed and a URM 67 cable ran up a 2 metre mast to another omni-directional antenna. We used two 12 volt leisure batteries to power the electronic paraphernalia. We attached a solar panel onto the top of the canopy, which in turn was connected electrically to the batteries to provide charging for them. We used a 'cheap and nasty' quality 12 to 240 volt inverter, which gave us the ability to drive the base-station, camera and laptop. The speakers were connected to a 12 volt amplifier and to this a small mixing desk, microphone and mini disc player, so that we had some tunes to listen to and the ability to do vocal announcements. All pieces of electrical equipment were securely fixed to the rickshaw using a combination of wood and screws, gaffer tape and cable ties. We ensured that no cables were trailing or could get caught in the mechanism (or round people's feet etc.). We used a Pixord NC-100 network camera to send pictures from the iTrike back to our communications vehicle and to the other Internet terminals situated in the café. This camera is ideal for this type of application as it is a self-contained unit containing its own miniature web server with the ability to customise web pages and upload them using FTP. The camera appears to be capable of a frame-rate of around 12 fps and delivers images using its own Java application with a frame rate that follows the speed of the network connexion. We found that version 2.24 of the camera's BIOS (Basic Input Output System) worked best and the Java application was viewable in most browsers, including Mozilla. However, the web-based configuration tool seemed to work correctly only under Internet Explorer on Windows, which was a little disappointing. The camera is housed in a robust metal box that may be mounted by a screw. We did, however, find that the thread on the camera mounting did not have a sufficiently high relief in order to mount it onto a standard camera tripod (we have tried three different manufacturers' tripods with no joy). 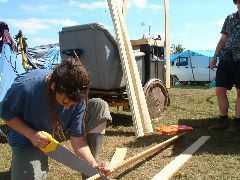 We used a 50 mm machine screw to attach the camera to a wooden baton which was then fixed to the wooden structure of the rickshaw. 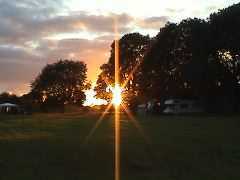 We fitted a very wide-angled or 'fish-eye' lens to the camera. From a network perspective, the camera was given an IP address of 192.168.100.235 and was plugged into a spare LAN port of the base-station mounted on the rickshaw; thus we were able to see live video back at the Internet café, which was useful for locating the rickshaw when it was being wheeled off around site.  The Java applet also allowed stills to be taken in the form of JPEG (Joint Photographic Experts Group) images. We could have made the feed from the camera available over the Internet, but we chose for simplicity's sake to use it only over the local network. For information on using the camera over the Internet refer to this article. 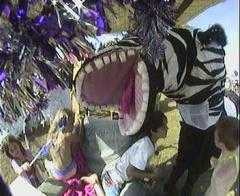 Yes, that is a giant pantomime Zebra. 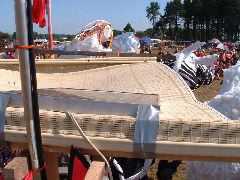 One of the other parallel activities that we were involved in was live audio streaming over the Internet of the British folk protest band Seize the Day who played on the Croissant Neuf Solar Powered Sound Stage on Sunday 3rd August. To do the streaming, we used a laptop running GNU/Linux and the LiveIce audio encoding and streaming programme. This streamed to one of our audio servers running the Shoutcast compatible IceCast audio streaming server. 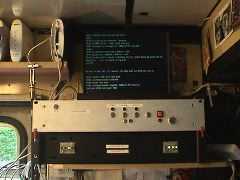 We connected to the audio server from the Internet terminal on the iTrike using xmms and relayed what was going on inside the Croissant Neuf marquee around the village green in true mobile fashion. 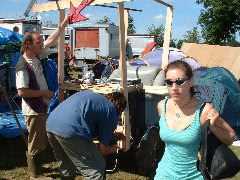 As mentioned above, fossil fuels are not considered acceptable power solutions at the Big Green Gathering. 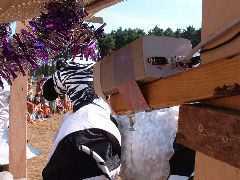 Last year (2002), we used solar power from Groovy Movie and a pedal generator. For details, refer to last year's article. 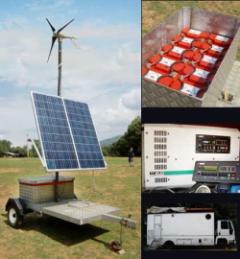 This year, with a larger network to power, we called upon the equipment and skills of Raymundo, a mobile solar and wind generation vehicle, with a very friendly and helpful Scottish crew, one (or several) of whom we believe is (are) actually called Raymundo. Raymundo came to the Big Green Gathering armed with an array of twelve 115 Watt solar panels (Solar Fabrik), effectively providing just over 1300 Watt (1.3 kiloWatt) of power during full sunlight. This amount of power at 12 volts needs very careful handling and regulation. All the cables and connections used need to be adequately rated, as at 12 volts 1kiloWatt equates to a current of just over 100 Amperes. 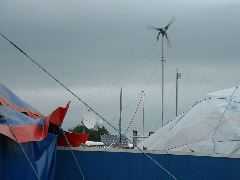 Also mounted on a 4 metre pole above the Raymundo vehicle an Air 403 wind generator was rigged. This wind generator is capable of providing 400 Watts in strong wind and features an internal regulator and protection against wind speeds which are too excessive. 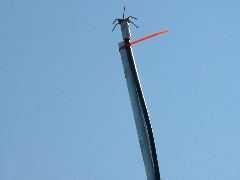 The wind generator required guy wire stays fixed in four directions for safety. The solar current thus generated was fed via a regulator into a bank of 22 deep cycle 110 AmpereHour batteries. By rough calculation, this bank of batteries when fully charged could power the 200 Watts of our core network for around 77 hours continuously. This situation would only occur if there was no wind or Sun for nearly 4 days, which was highly unlikely where we were, high on the Mendip hills; although it did rain an awful lot, which wasn't too helpful. Just in case, they had another backup bank of batteries half the size, all charged on wind and solar energy. 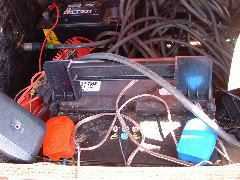 Running off the battery bank Raymundo have a 2.6 kiloWatt Trace inverter (SW2612E), installed into the vehicle, which converts the 12 Volts dc (direct current) into 240 Volts ac (alternating current) for powering ordinary UK household equipment. The 240 Volts ac was then distributed to us and those around us needing power. Once we have consulted the Raymundo crew, we will post circuit diagrams here. Refer here for Air 403 wind generator wiring. Before turning on the inverter, the negative terminal of the batteries, the earth outlet on the inverter and the chassis of the vehicle are all connected together and then connected to a good copper earth spike hammered deep into the ground. This ensures that they are all at the same potential. The neutral outlet on the inverter is then connected to the earth at the outlet of the inverter. The 240 Volts ac is then fed through an RCD (Residual Current Device) rated at 30ms, and an MCB (Miniature Circuit Breaker) rated at 15 Amps. This makes it safe for use in a field. 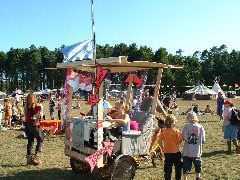 The iTrike worked very well indeed and we were able to provide mobile Internet access over a large area of the festival site. We rarely lost the connexion between the base-stations, and when we did, this was largely due to passing too close behind a large obstruction, such as a truck or marquee. So long as we stayed a safe distance of around 10 meters from anything large in between the wireless devices, we had a good connexion. Mostly we were able to achieve the maximum speed for 802.11b networks of 11Mb/s , dropping to 5Mb/s on occasion. This was no cause for concern as the down-link connexion from the Internet via the satellite dish was around 1.5Mb/s maximum. 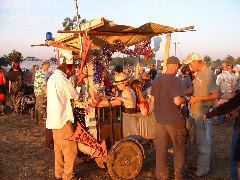 People were surprised and entertained by the contraption, which was decorated in line with the festival spirit and the intention of countering the dryness that surrounds computing and technology in general. When some doubting Thomas actually did discover that they really could get on-line and be ridden/pushed around the festival, they were very impressed, sometimes almost flabbergasted. It made a great platform for demonstrating what can be done with the technology at hand and also enabled us to promote the GNU/Linux operating system to people. Interestingly enough, it was the children who seemed to take the fact that it worked more for granted and who most easily adjusted to using a mobile Internet terminal. At one point we had around 7 children on the back of the machine, which made progress considerably more difficult. 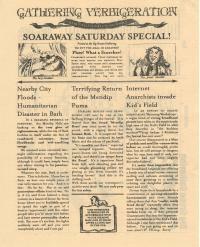 one of the festivals lighter gossip papers. The cider was marvellous. As was the mud. Wireless is great and you can achieve a good range with it, especially using two base-stations in WDS mode with external, extended-range antennae. We easily had a connexion between our communications vehicle and the iTrike up to 300 metres away. Having a real police light on top of your rickshaw can apparently make you resemble an emergency services vehicle and cause confusion and consternation amongst festival organisers and security. Using the base-stations in bridge mode is a good idea and greatly simplifies your network model. A machine running Linux also makes a much better DHCP server than the base-stations themselves. Mud can be a limiting factor, especially mud that's drying out. Be careful not to get your iTrike stuck. If you do, you will need assistance. It is very easy to over steer on a tricycle, remember that you simply need to turn a little and the back wheels will follow you around. Ignore the lean of the vehicle, leaning will send you around in circles. Some people are not easily convinced that you indeed have mobile Internet access on a rickshaw and some even refuse point-blank to allow you to prove it. Children seem to be more conscientious at giving donations for free Internet access than adults. No conclusion as to why. Generally women and children appear to be the best clientèle to have when doing this sort of thing. They both simply sit down and get on with using the computer for what it is. Men tend to complain a lot and ask one lots of technical questions. Women and children give larger donations too, and more readily. Removing your blue plastic cover and therefore having a bright white flashing light on top of your rickshaw produces a kind of strobe effect, which can confuse and disorientate festival goers and security alike. Metal objects really interfere with wireless networks. Going behind a tall parked vehicle meant loss of connexion in most instances. Tents were not quite as bad. People who live in rural areas or who travel around (such as many performers) are much more appreciative of Internet access being available in the middle of the field than their more blasé counterparts who live in cities and take it much more for granted. If you are going to build an iTrike in a hangar or marquee, ensure the exit is tall enough not to bend the antenna upon leaving. A good pair of Wellington boots is always essential when in the British countryside, even in mid-summer. Placing a piece of pink cloth over the top of your blue police light, produces a nice 'fluffy' shade of pink that soothes and reassures festival goers and security alike. This can eventually overheat your lamp and cause melting and distortion of the blue plastic cover. If your pigtails were supplied with strain-relief brackets, we recommend using them to prolong the life of your pigtail. They are really fragile. * - To our knowledge. The reason that the ping time when using a satellite for Internet access is so long is a factor of the physical distances involved. A geostationary satellite is roughly 36,000km away, and the radio signals, travelling at around the speed of light (300,000km per second) have to reach the satellite and then route back to the network operations centre providing the Internet connexion. If the send and return path are via the satellite (bi-directional) then the radio signal path is four times the distance to the satellite, or around 144,000km. A quick bit of arithmetic; 144,000 divided by the speed of light 300,000 gives roughly 500ms or half a second. Add a small amount of delay for network processing at each stage and you end up with around 650ms delay. This latency is not noticeable in non-interactive medium such as satellite television. LFNs require a change in a number of network parameters including the TCP (Transmission Control Protocol) send and receive window sizes (refer to RFC 1072 for more information) and this change need be made solely on the proxying machine, as it will be the one that makes the actual request over the LFN and not local machines running on the LAN; thus removing the need to make adjustment to network settings on every machine needing to use the connexion. The other obvious advantage is that it can act as a firewall to the outside world and hence protect the connected network to a large degree. Since writing this article it's come to light that although the Flash plug-in for web browsers does not work under GNU/Linux on the PowerPC platform, there is a way to run the standalone Flash Player 6. Copyright (c) 2003 Psand Limited. Permission is granted to copy, distribute and/or modify this document under the terms of the GNU Free Documentation License, Version 1.1 or any later version published by the Free Software Foundation; with no Invariant Sections, with no Front-Cover Texts, and with no Back-Cover Texts. A copy of the license is included in the section entitled "GNU Free Documentation License". media information technology, mobile, pan european, internet service provider, bi directional satellite, wireless network, wireless community networking, omni, omni-directional, rickshaw, rick-shaw, rick, shaw, ji riki shaw, trike, tricycle, three wheels, two-way, Astra, SIT, DVB-RCS, big, green, gathering, 2003, wireless,802.11b,link,cantenna,can-tenna,sector,whiskey,onmi,omni-directional,omni-directional, camera,client,server,microphone,cafe,actors,webcam,live,broadcast,Ethernet,transmissions,internet,public,access,connectivity,linux,free,Debian,GNU,software,psand,uk,europe,britain,internetwork,network,cables, G4,PowerBook,Titanium,compliant,interesante,Psand,communication,services,consultants,consultant,bandwidth,art,NAT,port-forwarding,filters,Cheddar,Pixord,pixord,gathering,solar,sustainable,raymundos,hippies,cycle,cider,802.11g,WBR-G54,WBRG54,Buffalo Technology,zebra,sheep,whacky,races,media information technology, mobile, pan european, internet service provider, bi directional satellite, wireless network, wireless community networking, omni, omni-directional, rickshaw, rick-shaw, rick, shaw, ji riki shaw, trike, tricycle, three wheels, two-way, Astra, SIT, DVB-RCS, big, green, gathering, 2003, wireless,802.11b,link,cantenna,can-tenna,sector,whiskey,onmi,omni-directional,omnidirectional, camera,client,server,microphone,cafe,actors,webcam,live,broadcast,Ethernet,transmissions,internet,public,access,connectivity,linux,free,Debian,GNU,software,psand,uk,europe,britain,internetwork,network,cables, G4,PowerBook,Titanium,compliant,interesante,Psand,communication,services,consultants,consultant,bandwidth,art,NAT,port-forwarding,filters,Cheddar,Pixord,pixord,gathering,solar,sustainable,raymundos,hippies,cycle,cider,802.11g,WBR-G54,WBRG54,Buffalo Technology,zebra,sheep,whacky,races.